I’ve owned Plant Dreaming Deep for a couple of years at least. It’s always funny, isn’t it, when a book that has just been sitting on the shelf suddenly catches your attention, as if its moment to be read has finally arrived? I sometimes think of it as a ripening process — though whether it’s me or the book that needs to mature, I’m not always sure. I picked Plant Dreaming Deep from the shelf almost at random on Monday morning, to look at as I enjoyed a leisurely cup of tea in honor of Victoria Day — and then I stayed at the kitchen table for two hours straight until I’d read the whole thing. I fell right into it, which isn’t an experience I’ve had with a book for a while. After a year they began to haunt me as if they were animals kept underground and dying of neglect. How long would they stay alive? And how long would the life in me stay alive if it did not find new roots? And so she went on a quest — one which took the form of finding, renovating, and then living in her farmhouse, but which is really about integrating all the parts of her life and history and finally being, not just settled in her house, but at home in her self. Plant Dreaming Deep is the story of that adventure, including both its literal, external parts and its internal adjustments and revelations. I found out very soon that the house demanded certain things of me. Because the very shape of the windows has such good proportions, because the builder cared about form, because of all I brought with me, the house demands that everywhere the eye falls it fall on order and beauty. So, for instance, I discovered in the first days that it would be necessary to keep the kitchen counter free of dirty dishes, and that means washing up after each meal; that the big room is so glorious, and anyone in the house is so apt to go to the kitchen windows to look out at the garden or into the sunset, that it would be a shame to leave it cluttered up. From where I sit at my desk I look through the front hall, with just a glimpse of staircase and white newel post, and through the warm colors of an Oriental rug on the floor of the cosy room, to the long window at the end that frames distant trees and sky from under the porch roof where I have hung a feeder for woodpeckers and nut-hatches. This sequence pleases my eye and draws it out in a kind of geometric progression to open space. Thus she finds reflected in it, supported by it, the “clarity and structure” she seeks for her poetry and prose. These demons, which might be called the demons of reputation, have two masks, and I do not know which is more distressing. There is the demon who wears the mask of rage: Why have I not been recognized? A young writer may be able to turn that demon away by taking refuge in the delusion of his genius, by thinking as a child does, “They’ll be sorry when I am dead!” For the middle-aged professional writer there is no such consolation. He has, willy-nilly, become a realist. He has to face the other demon, who wears the mask of self-doubt: Why have I failed? Where have I been self-indulgent, lazy, not honest enough? Or is my failure written into my very bones? Though she finds some reassurance in her success with readers, still “the only real way to keep [the demons] out is to shut the world out,” which she finds easier to do in Nelson than anywhere else. 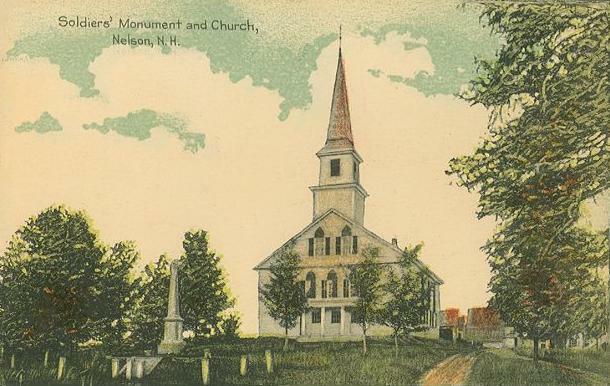 But even Nelson cannot shelter her completely from the demon of guilt that demands she weigh her solitary creative life against “teaching underprivileged children” or some other more socially sanctioned set of responsibilities: “For a single woman the question is acute.” The house contains but cannot overrule her anxiety. It is only past the meridian of fifty that one can believe that the universal sentence of death applies to oneself. At twenty we are immortal; at fifty we are too caught up in life to think much about the end, but from about fifty-five on the inmost quality of life changes because of this knowledge. Time is suddenly telescoped. Life in and for itself becomes more precious than it ever could have been earlier . . . it is imperative to taste it, to savor it, every day and every hour, and that means to cut out waste, to be acutely aware of the relevant and the irrelevant. There are late joys just as there are early joys. Young, who has time to look at the light shine through a shirley poppy? The outer world is only an immense resonance for one’s own feelings. But in middle age, afternoon light marbling a white wall may take on the quality of revelation. It was my first experience of the transition back to solitude, the moment of loneliness, the shadowy moment before I can resume my real life here. The metaphor that comes to mind is that of a sea anemone that has been wide open to the tide, and then slowly closes up again as the tide ebbs. For alone here, I must first give up the world and all its dear, tantalizing human questions, first close myself away, and then, and only then, open to that other tide, the inner life, the life of solitude, which rises very slowly until, like the anemone, I am open to receive whatever it may bring. I think it was when I realized that the book was less about a house than about being alone in a house that I lost myself to it. I am fascinated by solitude. Often I enjoy it; sometimes I crave it — but I’m also well aware that, as Sarton says, “at any moment solitude may put on the face of loneliness.” I’ve only lived alone (that is, truly in my own quarters, without roommates or family) for two of my 46 years, in the basement suite I rented as an undergraduate. I am chatty and enjoy being in company both intimate and lively, but I also feel a certain exhilaration when I’m alone. It’s not just being freed for a while of the endless negotiations that life with other people inevitably entails, though that’s certainly part of it; it’s also as if some kind of psychological space opens up — if that makes sense. I hardly know how to put it, but I’m sure I’m not the only bookish person with a preference for quiet and difficulty separating herself emotionally from whatever other lives are going on around her (in fact, I’m related to at least one other person just like that!). People sometimes interpret a desire to have some “alone time” as rejection of them, but I find it can be crucially restorative and can send you back to them with renewed pleasure. Really living alone, though, rather than just spending some time alone, takes courage, as well as inner resources. Sarton’s story here is not of uninhibited bliss: there’s guilt and anxiety, as already mentioned, but also fear, hard work, and constant demands on her self-reliance. 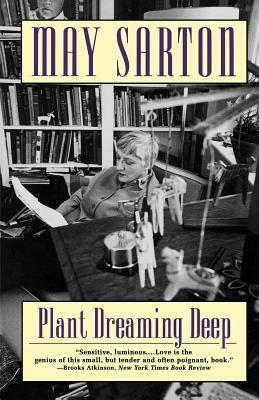 Heilbrun notes that a few years after Plant Dreaming Deep was published, Sarton moved again. Heilbrun sees the move to Nelson, the “first, hard assertion of selfhood,” as a necessary step for Sarton in generating a narrative of her own life: “What Sarton did was to write a new plot for women, a new script.” Just knowing such a life is possible, knowing what it might feel like or mean, she suggests, is something other women needed. I’ll never live alone in a farmhouse in rural New Hampshire — I wouldn’t want to! But maybe at this point in my own life it was important for me to imagine the life that Sarton lived in hers. You can be alone even without solitude, after all. We all need to find the resources we need to be at home with ourselves wherever we are. Maybe that’s why I couldn’t stop reading until I’d seen how it turned out. Thank you for pointing me towards a rare book that focuses on some of the positives of being a woman alone, I’ve been looking for more books that treat solitary women as something other than warnings! In Journal of a Solitude she was to speak of her fears that in Plant Dreaming Deep she had not sufficiently rendered her anger, her rage, her sense of isolation, both physical and artistic, not the agonies of love. Had she led some woman astray by idealizing her lonely struggle? Heilbrun says the answer is “emphatically, ‘No,'” and I’d agree that while there’s a lot of beauty in Plant Dreaming Deep, it didn’t strike me as idealizing. That’s part of what made it so interesting to me. When I first took time off work with chronic fatigue, it was quite hard to be alone. I craved solitude, but my thoughts raced and raced. The negative emotions rose. And then, gradually, I realised I was clearing myself out, like a vast psychic spring clean. Since then, I’ve discovered that I need at least 6 hours alone every day if I’m to stay sane. I know I am unusual, and far more anti-social than most people. But being alone is meat and drink to me. I simply cannot bear it when well-meaning individuals try and insist that I must be lonely or sad or somehow wrong to not need company. Why is it such a galling notion to some people? Anyway, I accept it now as a necessary part of my life. I really enjoyed the May Sarton we read with the Slaves – I can see I’ll have to get hold of her journals, too. Litlove, I picked this book up soon after we read The Small Room for the Slaves. I’ve read only one other of her novels so far but given how much I’ve liked everything of hers that I’ve read, I’m going to keep collecting titles. It is interesting that some people take it so personally that you need to be alone. Even the word “anti-social” seems unduly pejorative. It’s great that you have come to accept it as just part of who you are and what you need. I actually spend quite a bit of time alone — in my office, for instance — but that doesn’t have the restorative effect of being alone when or because I want to be alone. Sometimes I feel so squirrely from hours alone at work that I buzz off to the local mall to get lunch just to hear the hum of human activity around me! And yet I can still come home from those work hours craving a different kind of solitude. Sarton considers the possibility that this is all just self-indulgence, and I suppose it is in a way, but I’m coming to think that self-indulgence and self-acceptance are closely related and both important — provided they don’t make us just selfish! I had never heard of this book, but it looks great. Thanks!